Scurvy you say!?!?! Arrrgghh here be an informative PSA about scurvy from none other then a pirate! Want more Scurvy Awareness Day info and fun? Pop over to Limestrong to learn more. 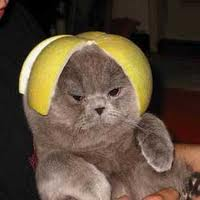 Make sure you check out their Mascot: Cats with citrus on their heads. No really, I can't make this kind of stuff up!! Citrus (including lemons, limes, oranges and grapefruit) is a rich source of vitamin C that both prevents and cures scurvy. Other fruits commonly available with higher vitamin C content are blackcurrant, red pepper, guava, kiwifruit, redcurrant, elderberry, strawberry, melon, passion fruit and mango. Certain vegetables are also good sources of vitamin C: Broccoli, Brussels sprouts, spinach and cabbage contain the highest concentrations.